INT. COFFEE SHOP – Regular Dan sits waiting for Pessimistic Dan (PD) to show up. This is slightly complicated, as they are the same person. RD: …And I’ll have a half Diet Coke, half regular Coke. Trying to watch the figure. Just mix them up together, yes. RD: DON’T EVEN ASK, JUST BRING IT! Sorry. I’m a bit stressed out. My friend (friend? he wondered internally if that was the right choice of words) isn’t here and I’m getting a bit worried. RD: Where the hell is this guy? (looks at his watch) Hey, don’t spit in that! Candles burn low on the table. Which is a bit odd, considering it’s a coffee shop. RD: I mean, come onnnnn. Seriously. (Looks at his watch again) I mean, you think you know a guy. You share the same brain, you make an appointment and you expect him to show! Alright folks, this jerk is nowhere to be seen. Which, given the month the Jays have had, kind of makes sense! Let’s get started without him. You see, Pessimistic Dan only really likes to show up to rub in the Jays failings, to point out their deficiencies and predict nothing but the worst for them. But the Jays ripping off a 21-8 month of May, taking control of the American League East and looking legitimately like the team pundits predicted would take the league by storm in 2013 has a way of raining on his downer parade, doesn’t it? The best part is the whole thing looks real. There have been some amazing feats achieved during the month. Edwin Encarnacion tied Mickey Mantle – yes, that Mickey Mantle – for the American League record for most home runs in the month of May. Mark Buerhle won his 10th game on June 1st, and while we’re generally suspect of the ‘wins’ stat here at the Same Page, only Roger Clemens has ever done that in Blue Jays uniform. Casey Janssen has been lights out since his return, Adam Lind is hitting the cover off the ball and Jose Bautista looks like he looks when healthy – like the best right fielder in baseball. That said, there are still players that are under performing/working their way back to respectability. There are still improvements to be made. That and the stars are playing like stars – it’s a weird concept for a beaten down Toronto sports fan, but that’s actually what they’re supposed to do. With Jose Reyes’, Melky Cabrera, Bautista and R.A. Dickey’s nagging injury issues last season, the Jays were never really a complete team. Those players are all healthy and performing up to/beyond expectations this season. Funny how that can make a difference. While we wait and see if PD will rear his ugly head and take his medicine like an imaginary man, let’s take a look at the five things that lead me to believe the Jays can sustain this success moving forward. The stars are finally playing like it at the same time. This is a team with moves to make. As good as they’ve been, the talk of the town is what they would have to give up to add a Jeff Samardzija or a James Shields – both big name additions. Marcus Stroman made his first start of the season this past Friday and looked excellent. If he can give the Jays anything approaching consistency as a fifth starter, that’s a huge bonus. The Jays are riding Juan Francisco and his power lefty bat right now but if he goes cold (history says he will) they may be in the market for a 2nd baseman as well, with Brett Lawrie sliding back to third. The point is, this a team that’s in first and is still looking to improve itself. It’s the best possible position to be in. It’s amazing what a healthy combination of Reyes/Lawrie, a matured Anthony Gose and any catcher not named Arencibia can do for your team defense. That and the removal of Melky Cabrera’s spinal tumor! The Jays have played excellent team defense all season, combining versatility with outstanding individual efforts. Lawrie has used his athleticism to transition between second and third base, Jose Bautista threw out not one, but two players at first base, from right field, this month. The Jays feature Mark Buehrle and Dickey, who are both multiple Gold Glove winners at the pitcher position and Dioner Navarro has been a rock behind the plate. In short, this team can catch the ball. And when you do that? Everything else seems to get a whole lot easier. What just a month ago looked like a gaping hole has become an unorthodox source of strength for the team. With Colby Rasmus on the DL, the team has turned to a platoon of Kevin Pillar and Gose in centre field and the results have been excellent. Casey Janssen’s return to health and Dustin McGowan’s return to the bullpen have allowed them to carry an extra body, and the Jays have responded by carrying three catchers, the only American League team to do so. Each offers their own strength – Navarro is the everyday guy who is a good enough hitter against lefties to DH when another catcher plays. Eric Kraatz has a ton of power and a cannon arm. And Josh Thole has the ability to corral Dickey’s feisty knuckleball, which alone makes him an asset. Coupled with the aforementioned Juan Francisco and utility man Scott Tolleson, the Jays bench has contributed immensely to their success so far this year. People hate Gibby. I love him. He plays platoons, knows how to manage the bullpen and isn’t afraid of taking chances. The players seem to love him and he’s the kind of even-keeled manager this team needs. I’m not going to say anything more. People ripped on him when this team was down – where are those people now? Hopefully choking down some undercooked crow. PD: HOLD IT! I’M HERE! I’M HERE, WE CAN DO THE SHOW NOW! RD: Well hello Shirley! Look who decided to show up. What have you got to say for yourself? PD: Eh, it was hard to argue with everything you just said, so I pretended not to be listening. I can’t argue with any of it, in fact. But there are a just a couple things that I want to point out. Mark Buehrle has a career home run to fly ball rate of 9.8%. He’s never had a full season where the rate was less than 6.0% and even that was only once. He’s usually well over 8.0%. This season? His average is 2.7%! He’s 35. He throws the slowest average fastball in baseball by anyone not named R.A. Dickey. This isn’t something he’s improved. He’s getting lucky and he’s bound to regress. 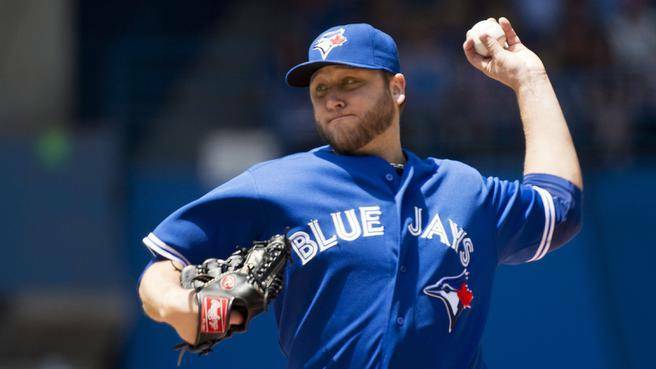 Can Buehrle continue to defy the odds? RD: That’s it? That’s all you’ve got? PD: …yes. I thought it was pretty good! He’s been the Jays best pitcher and he’s not going to keep it up! RD: Right. So your point is that he’s pitching out of his mind, he’s fourth in the league in quality starts, third in ERA and might give up a few more home runs? You actually want us to be concerned that he’s having success? PD: Well yeah! And don’t forget Colby Rasmus! This whole thing has happened without him. What happens when he gets back, starts whiffing and they send Gose back to Buffalo? RD: You want us to worry about getting back our starting centre fielder, who hit 22 home-runs with an .840 OPS last season? This is your big concern? I have to say, I expected more of you. Maybe this is the year when you finally, FINALLY, can’t have your cake and eat it too. PD: These are real problems! I will not be denied! And so the cosmic dance continues. 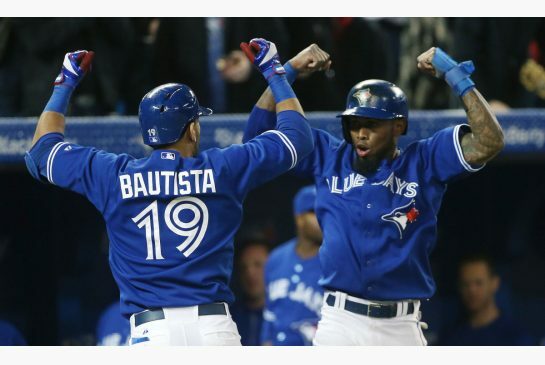 Join us here at the Same Page at the beginning of each month, as RD and PD continue to hash out the ups and downs of another tumultuous Blue Jays season. It’s going to be a bumpy ride.